Are you looking for an affordable way to protect your truck bed? Do you want something you can easily remove and reattach as needed? Have you ever considered soft top camper shells for this purpose? If you’re looking for an easy way to protect the items in your truck bed, look no further. In this article, we’ve reviewed five of the best Bestop soft top camper shells on the market today. You’ll be able to find one that works perfectly for your needs in no time. 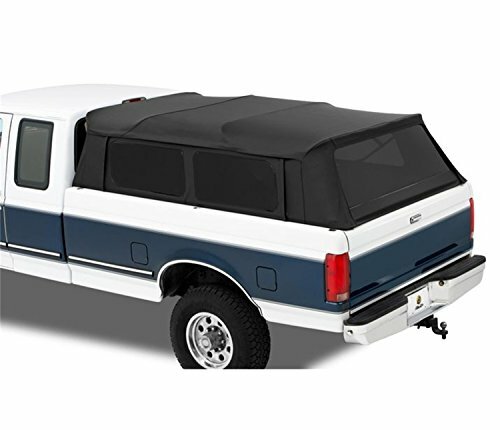 Soft top camper shells are molded frames with a fabric cover that are used by attaching them to the bed of a truck. They protect the bed and sometimes lock to keep everything safe and secure inside. To find one that works great for your needs, read on! 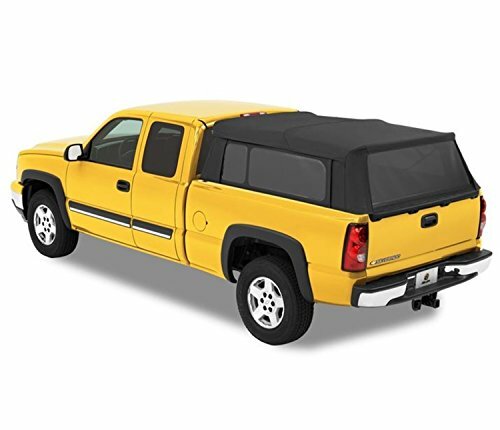 The Bestop 76305-35 Black Diamond Supertop for Truck Bed Cover is a great simple cover that works well for a variety of different vehicles. This minimalistic design provides all the protection your truck needs with very little hassle. The windows can be rolled up or down as needed on this camper. This is a snug and weather-resistant product that is great for longer trips. Installing this product can be challenging and may take more than one adult to get it done. Some products have arrived with damaged or pulled seams that may need to be repaired before the product can be used. Pick the Bestop 76309-35 Black Diamond Supertop for a sturdy and secure way to protect your truck bed. This camper shell, designed for use with vehicles without a utility rack, is sure to make a positive difference in the way you haul items. This collapsible camper is easy to put on and take off as needed in a few hours. The camper is also easy to store out of the way since it folds down fairly flat. The windows on this camper are very challenging to install alone. It is impossible to install this camper in cold weather because of its design. 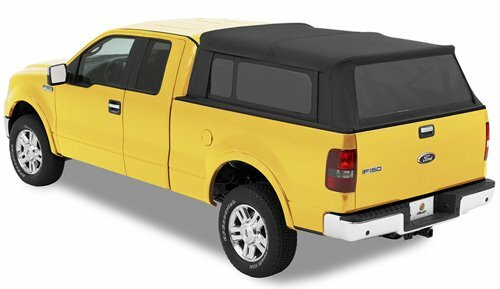 With the Bestop 76305-35 Ford F-Series Supertop, you can have all the benefits of a Bestop soft camper shell for your Ford F-Series pickup truck. 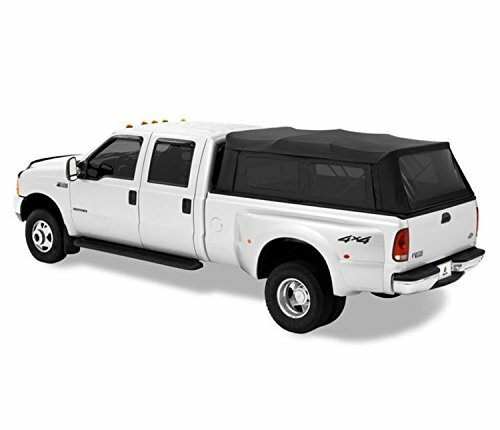 This is a durable and sturdy camper that fits well and is sure to provide you with all the protection you need for hauling items in the back of your truck. This product is designed to fit very well on the proper type of truck. The product holds up well to wear and tear as well as weather exposure. It’s very hard to get this camper put together properly. Removing or collapsing the camper is equally difficult and may require help. The Bestop 76317-35 Black Diamond Supertop is an updated variation of the Bestop camper with easier installation. It is held in place by a unique belt system that doesn’t require any holes to be drilled into the truck itself, and it stays firmly in place while it’s in use. This is a durable product made of tear-resistant fabric. The camper won’t affect the feeling of driving your truck. This is not a weather-tight product. The side windows do not detach easily on this camper. Choose the Bestop 76315-35 Black Diamond Supertop for a great product with zip-open panels and a tinted window option. This durable cover attaches with belts for a secure installation that will stay in place with no trouble. 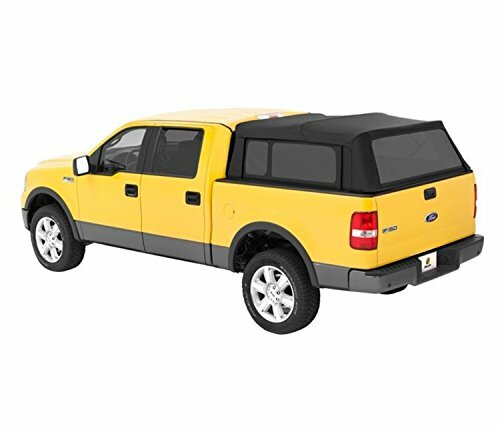 This top is easy to collapse as needed to access your truck bed. You can install this product without putting holes in the truck itself. This product is not very easy to set up the first time and may take time to do so. The product is very expensive. Soft camper shells are easy to install. They aren’t as heavy as their harder counterparts, so you should be able to put it in place and take it off as needed without help from anyone else. It’s easier to keep a softer camper shell clean. They can be hosed off in most situations and you don’t have to worry about them becoming too easily damaged. Soft camper shells are usually a little more affordable than the hard ones in most situations. If you’re looking for a good lower-cost option, it’s a good idea to get started by checking out soft camper shells first. If you need to protect the bed of your truck indefinitely, you should probably go with a hard shell. Soft shells are not meant to be left on at all times or for very extended periods of time, and they may develop leaks or tears more easily if you do this. If you need something that can lock, you may be able to find this easier in a hard shell. There are some locking soft shells out there, but you’re going to have an easier time locating a good locking shell that is hard instead of a soft one. If you want something you can use in inclement weather without any worry, a hard shell is a better option. Soft shells may hold up well to some inclement weather, but hard shells are going to be more durable. In the end, the choice is up to you. However, if you choose to try a soft camper shell, be sure to check out one of the may great products from those listed above. You’re sure to find something you love among them!